According to this, Jeri will guest-star in the March 3 episode of Psych: 4.15 The Head, the Tail, the Whole Damn Episode”. “Leverage” (Wednesday 13 2009, 9 p.m. on TNT): In order to take down an oppressive sweatshop owner, the Leverage team infiltrates the fashion world. 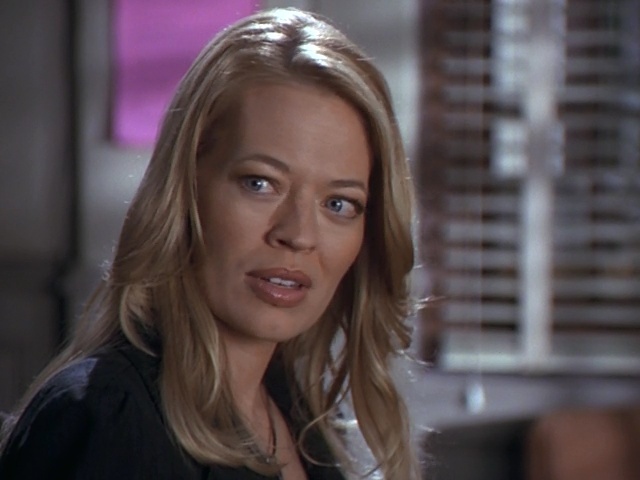 Jeri Ryan (“Star Trek: Voyager”) guest stars. PSYCH broke all records as the #1 original series premiere in 2006 and has since become a cult favorite starring James Roday as young police consultant Shawn Spencer who solves crimes with powers of observation so acute the precinct detectives think he’s psychic. Dulé Hill stars as Shawn’s best friend and reluctant sidekick, Gus and Corbin Bernsen as Shawn’s father, Henry. Timothy Omundson, Maggie Lawson and Kirsten Nelson also star. PSYCH returns with seven new episodes on a new night beginning Wednesday, January 27 at 10/9c. Shawn and Gus will find themselves in precarious yet funny situations when they tackle investigations involving the Army, the CDC and rafting on white water rapids. Shawn stars in his own Hitchcock episode as he is targeted by a killer using classic scenarios from the master of suspense in “Mr. Yin Presents,” co-written and directed by Roday. Guest stars include WWE superstar John Cena, Stacey Kiebler, Sarah Shahi, Craig Sheffer, Jeri Ryan, Michael Hogan, Judd Nelson and Ally Sheedy returns as the Yin Yang Killer. PSYCH is one of the seven original series that made USA #1 in basic-cable for four years in a row. Leverage to return on January 13, 2010. Posted on December 13, 2009 Author Ariane Comments Off on Leverage to return on January 13, 2010. According to Variety.com, Jeri will be starring in the horror movie “Secrets In The Walls” which will premiere next year. Horror pic features Ryan as a mother of two (Peyton List of “FlashForward,” Kay Panabaker of “Fame”) who finds that her new dream house in the suburbs outside Detroit is haunted. Jean-Baptiste (“Without a Trace”) plays the best friend who helps try to solve the mystery.